This LP has 18 parts. 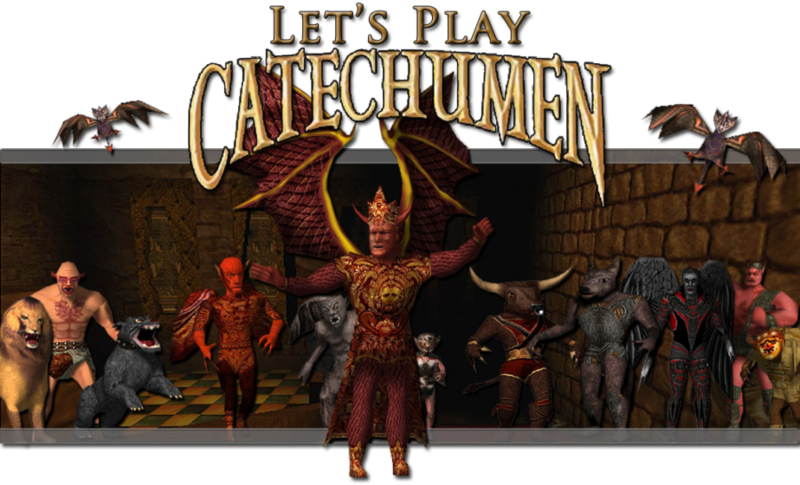 Catechumen is a Christian FPS title released by N'Lightning Software in 2000. It is perhaps the best-selling Christian FPS ever made, which is to say that it was a massive commercial failure that nearly bankrupted its developer. It is not a good game. However, unlike the hordes of terrible Christian game cash-in titles (like Guitar Praise or any of the games published by Wisdom Tree), Catechumen was actually created with the intent of making a good Christian video game. Its design is heavily influenced by both Doom and Half-Life, and action is prioritized over education or enlightenment. It's far more analogous to Veggie Tales than Left Behind in the intent of its creators, and you get the sense that the people who made this game really, really wanted to make a quality video game.